The Suzuki Hayabusa has long been the pinnacle of large-displacement hyperbikes. 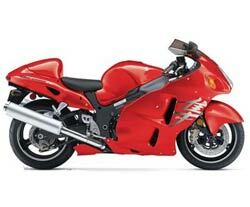 The new 2004 Special Edition GSX1300R adds an impressive third color to the Hayabusa lineup. The Special Edition Hayabusa GSX1300R will be arriving at your local Suzuki dealer in Spring 2004.